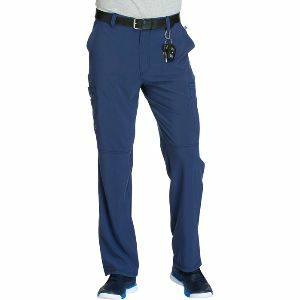 A Men’s Athletic fit tapered leg pant features an inside functional drawstring, back elastic waistband, five belt loops, a zip fly with button closure and a hidden inseam gusset for extra ease. Also featured are two front slash pockets, a right double cargo pocket with bungee loop and grommet, left welt cargo pocket, back patch pocket and knee seams. Inseam: 35"